This is your presentation or document outlining the features of three digital image-related pieces of hardware and two applications. This may have been covered in your A4 and A5 poster task write-up but probably best covered by the file format task showing a JPG, GIF and PNG against a dark background. The images and logo for the A5 poster task, included in your write-up of it. Changes you made during the A4, A5 poster task - maybe to original image (e.g. wrong size or no licence for commercial use or just an unsuitable image) or refinements made to which sections you used for the final output or maybe changes necessary to the text featured. P6 explain the potential legal implications of using and editing graphical images. M2 justify the software, tools, file format, image resolution and colour depth used for creating graphic images. There is a good opportunity to cover all of these in the A4 and A5 Poster task write-up. Alternatively you may refer to a different image editing or creation task where you have utilised a range of tools and had to consider effects of file format on size etc. This is your look at the future, what output media are being developed, latest technology and the findings from your research of a particular type. D2 discuss the impact that file format, compression techniques, image resolution and colour depth have on file size and image quality. Your file format slides, comparing a graphic across formats and colour depths can cover part of this if you have written a good comparison and dealt with colour depth there. In addition, or possibly alternatively, this can be achieved through an examination of either your work in producing the A4 and A5 posters or a different task that provides clear illustration of the effects and enables you to write in some detail, with examples, about compression options and colour depth. Create an image which is not rectangular and which has either some gradient(s) or shadows or effects that might illustrate how well different file types support display. Note the size of each file. Add the images to a presentation with a dark background which should emphasise the differences as in the sample provided. Comment on the suitability of each file type, including advantages and disadvantages. Add a note which explains the range of colours or colour depth available in each case. Illustrating the demise of a graphic or image as the number of colours is reduced can be effective evidence for higher grades too with your own research as to how the file size of an image is made up. 1 Download the 8 original images and save them with sensible names. 2 Re-size each image as necessary to obtain the required measurements. Any resolution above 70 dpi is acceptable for web use. 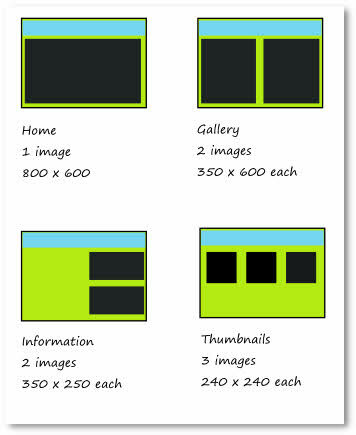 Some images, if not all, may need to be cropped so that only a section is used in order to meet the size requirements. You can enhance any image if you wish (contrast or colour adjustments etc.) but this is not essential. Images that have become out of proportion will not be accepted. 4 Store all the images in a single folder and provide a screen print of the folder. 5 Display all the images in a presentation or document – one page or slide matching each of the layouts required (4 slides or pages in total). Save that file and print it – for a presentation print a handout version with 4 slides to a page. The images should have licence terms that permit commercial use or, if this is not clear, you should provide a copy of an e-mail that you have sent to the owner, or owner / administrator of the site where you have obtained it seeking permission for use on a web site that will be promoting products related to endangered species, classics cars or space exploration as appropriate. The Melbourne Cup is the greatest and most prestigious race meeting in the southern hemisphere. Held over four days in late spring, it is four days of top quality racing and social preening- trackside tickets and extravagant dresses give added cache to the proceedings. There is perhaps no bigger communal event in the USA each year than Thanks Giving Day. And at the heart of it all are family reunions and large feasts, traditionally including the demolition of a large turkey with the extended family. Compared with the luxury, glamour and international recognition of other world film festivals, such as Cannes and The Oscars, The Cape Town World Cinema Festival is a rather smaller affair. Indeed, it is only, in 2008, in it 5th year. The Cayman Islands are rich in not only their seafaring history, but also in their pirating and pirateering... and in celebration of their pirate legacy, the Cayman Islands host their own Pirates of the Caribbean Week in November. Viewers of the more obscure television sports channels available nowadays will probably be aware of the annual Surin Elephant Round Up. For it is here that teams of elephants with human drivers sitting atop play games of football against each other- with hilarious results. The central tenet of the Pushkar Camel Fair was originally a Hindu religious celebration, coming at a time of a full moon in November (usually). However, over the years, this site of pilgrimage had people from all over India flocking to the town with camels and cattle for a three day market- in which the animals were traded. So now, in a blaze of tourist brochure colour, religion and tradition, the population of Pushkar swells from 14,000 people to over 200,000 for the week’s festivities with tourists from all over the world joining pilgrims and traders from India in Pushkar. It is a week of enduring images- from huge areas containing thousands of camels, often adorned in multi coloured cloths and jewels being traded throughout the day, to the camp fires at night, blazing under the midnight hue of the moon. St Martin`s Day, on 11 November, is a day that Christians and Protestants alike celebrate throughout many countries and regions of Europe. In the Zagreb county of Croatia, the day of Saint Martin is a day for wine lovers, a day to purify the newly harvested wine and dine on succulent roasted goose. For an animal that doesn’t get much attention from the world at large (ok, city dwellers) for most of the year, it’s funny how the bull is the animal du jour when it comes to events. The countless, bloody sacrifices that scarred the lives of millions across the world due to the slaughter on the trenches of the First World War are commemorated each year on Remembrance Sunday. Despite recent political instability, Kenya is still one of Africa`s top tourist destinations. It`s got the great safaris, the superb wildlife, the wonderful beaches, the terrific food... but with all this, sometimes visitors miss out on the cultural side of this beautiful country. You will be provided with a list of some events, with brief descriptions, taking place around the world during November. You may know of some more and may like to include those too or share them with colleagues. 1. Consider ways to make this list more attractive and so more likely to be read and have some impact. Find a more suitable graphic or image to accompany or illustrate the events that you feature in your display. The text provided needs to be included somewhere in your document or publication to describe each event in brief. 3. Where possible, add links to web sites with more information in addition to the brief description provided on your sheet. This could simply be a link to the site where you obtained your image. A note of where each image’s original location should be kept and this information either incorporated in the main document or publication itself or as supplementary notes. For the purpose of the first part of this task, it will be acceptable to use images that are not licensed for commercial use or re-use except where you are including them in a blog or a web site or storing them (or the publication) on-line. 4. As an extension to this task you could consider revising your draft publication to be suitable for distribution or publishing on-line. This would necessitate using only images for which you are confident an appropriately license applies (or for which you have permission to use). Replace images accordingly, including revised notes of where the replacements have been obtained. An A4 sheet measures about 30cm wide by 21cm high. Or about 12 inches by 8½ inches. To allow for printers that might not print to the edges, we’ll use 11 inches by 8 inches. To cover 11 inches, you need 11 x 300 dots. That’s 3300 dots. Now, technically, dots aren’t exactly the same as pixels but pixels will do just fine for this type of task. So that’s an image at least 3300 pixels wide that you need. Just to be on the safe side, you should check the height too. To cover 8 inches you’ll need 2400 pixels. Where will you find a suitable image? Remember that this is for commercial use so you can’t take any chances with the first one you find on a normal Google search. You’ll need to use either Google’s advanced image search tools and set the requirements to licensed for commercial use or use another gallery like morguefile, stockxchange or others where license terms are shownso you have evidence it’s OK to use it. What do you want an image of? First of all save the original somewhere. then save it again with a different name and use that copy for the edits. Then if it all goes horribly wrong you can start afresh. The actual image you’ve found will almost certainly be the wrong size so change that. In Serif PhotoPlus that’s quite simple - Image | Resize (making sure you keep the ratio or the image will be distorted). Change the resolution first to 300dpi and then the width to 3300 pixels. Is the height now more than 2400 pixels? It probably will be as many images are in a 4:3 ratio but not all so check. If the height is less than 2400 pixels you’ll need to set the height to that figure instead. Either way, you’ll still have an image that is too wide or too tall. So another edit is needed to cut some of it off. Your choice - use crop tools to achieve the required size. A better way to get the right size would be to crop the original size image down to dimensions that are proportionate to what you require. For example, a rectangle 4400 x 3200 would work. Then you could resize either the height or the width and it would give you 3300 x 2400. That does require some calculations, though, and a bit more thought - so if you can’t figure that out stick to the first method. Save this file regularly (in whatever format the software uses). The task needs you to make changes to the appearance of the image now. There is a huge range of choices so it may be a good idea to try several variations. Just save each with a separate file name. Once you’ve decided on one you need 3 versions: the (new) original, a PDF and a version for the web. You’ve got the first one - that’ll be something like image.spp or image.psd. Now for the web version. First, 3300 is too wide for the web! The task says between 1000 and 1200 pixels wide so some further changes are required. It may be sensible (but not essential if you know what you’re doing) to save the file again with a different name before these. Something like image-web.spp or whatever would be a good name. For the web, resolution above 100 is pointless as monitors don’t show any more than 96dpi or, in most cases, only 72dpi at best! So if you were to use Image | Resize again and change the resolution to 100dpi you’ll find that the dimensions will change to 1200 pixels wide - which is what you want. The height will also be OK too. Then use File | Export Optimiser (or similar) to transfer the image to another file type. The choice will be between .jpg (or.jpeg) .gif and .png Ignore anything else you’re offered. For each file type Serif PhotoPlus displays what the image will look like and its new file size in kb. You have to get your file size down to less than 120kb. For each file type there will be quality settings - either a sliding scale or to choose a number of colours to use. Try out various settings. You’re looking for the best combination of good quality and least file size within the 120kb limit. You’ll probably find a lower .jpg setting will give the best compromise but it’s worth keeping screen prints (or saving separate files) of a range of settings to provide evidence for other criteria you can write about later. Save the chosen file as image-web.jpg or whatever and that’s the practical part of the task done. In order to present the work you’ve done, and illustrate notes about how you’ve done it in your portfolio, it’s a good idea to place the amended original, the PDF and the web version(s) in one folder. You can then take a screen print displaying the file sizes and types easily for comparison. The original (pre-edit) file can be included but it’s not essential.